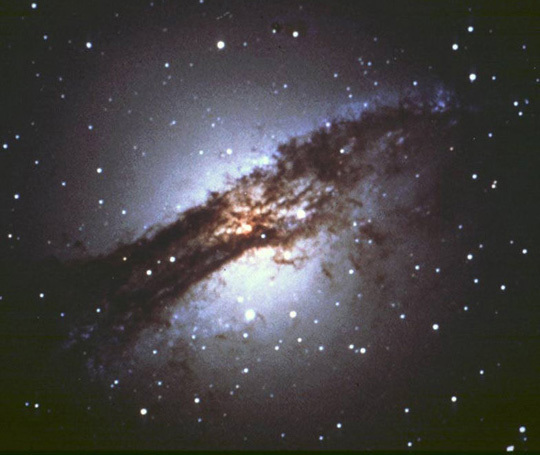 Centaurus A is a very peculiar galaxy. Its spherical brightness is much like an elliptical galaxy, and yet its dark and wide dust lane is an extreme version of a spiral galaxy seen edge-on. Through a telescope, this object is quite a sight, and it shares the same area of sky as the famous Omega Centauri globular cluster. To star-hop to this object, you can use Omega Centauri as a guide. 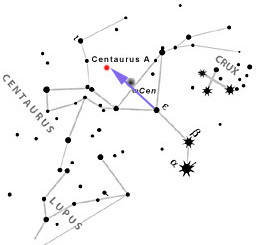 The distance between Omega Centauri and Epsilon Centauri is the same distance as between Epsilon Centauris and Centaurus A. Or, connect the imaginary line between Omega Centauri and Iota Centauri and aim your telescope at the middle. Remember, the R.A. and Dec of this object are: Right Ascension 13h25m30s, Declination -43°01', if you prefer to use setting circles.